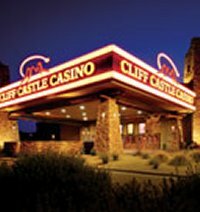 The Cliff Castle Casino in Camp Verde Arizona has 60,000 square foot gaming space with 670 slots, blackjack, poker, 82 room hotel and 6 restaurants. Located about 75 minutes NE of Phoenix. The Lodge at Cliff Castle next door to the casino offers a heated pool and hot tub to help you unwind from a busy day. The hotel has 82 rooms and 2 suites.